After practicing yoga for many years, Jodi Boone was drawn to sharing yoga with others and began teaching yoga in 2001. Over the years she continued her study of yoga by attending numerous teacher training courses, retreats and workshops. The path of yoga also led her to become a certified pre-and post-natal yoga instructor and birth doula. She has also studied yoga’s sister science, Ayurveda, and holds a practitioner certificate. Jodi feels that yoga is a precious gift and one of the greatest influences in her life. Like many, she initially was drawn to yoga for the physical benefits, but realised immediately that the practice transcended the physical. Affecting her deeply emotionally and spiritually, her mat felt like the softest, kindest and most meditative place in the world. 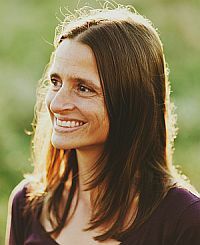 Jodi has been living in Goa, India for the past 6 years co-directing Satsanga Retreat. To learn more about her, you can visit her website. Each season, people from the world over descend upon Goa, India to be a part of a culture that has left the modern world of haste behind. 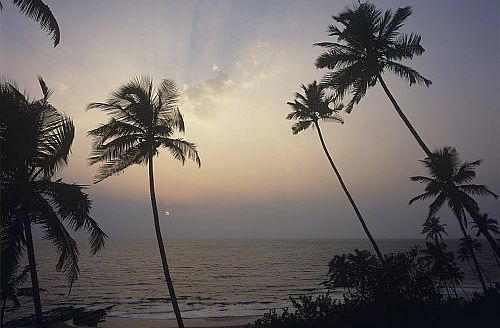 As so poignantly put by an expat friend of mine: Goa is not a destination, but rather a way of life. Today, though, Goa is enjoying a second, emerging reputation as a Mecca for yoga. The most renowned and beloved yoga teachers in the world come to Goa to set-up shalas for the season and offer retreats and trainings at the plethora of yoga retreat centres. The two contingents – the partiers and the yogis – coexist beautifully; often intersecting. Ashiyana, located on Ashwem Beach in North Goa, is a world-class resort with beautiful Asian-inspired architecture. Obviously a labour of love, each year, the owner upgrades the grounds, structures and gardens, improving upon what seems impossible to improve. Perfectly located, just a short walk to the beach, Ashiyana specializes in detox and rejuvenation retreats. Open from November to April, Ashiyana, a full-service retreat centre with a restaurant and spa, offers yoga holidays, as well as drop-in yoga classes for their houseguests. Aum Yoga and Healing (no website) is a sweet spot in Anjuna owned and operated by a lovely Indian teacher named Aum, who offers classes on his rooftop shala. Aum is humble, authentic and teaches classical hatha yoga. He always begins his sessions with pranayama and ends with guided relaxation. Aum is a student of naturopathy, as well as an energy worker, and he integrates both disciplines into his teaching. Classes are offered every morning and on some afternoons, except Sunday (located just before the Anjuna traffic circle, kiddy-corner from the massive Saint Michael’s Church). Brahmani Yoga, the pulse of the yoga community in North Goa, offers a full schedule of drop-in classes, seven days a week from early morning to evening. If you’re staying in North Goa and don’t want to commit to the schedule and structure of a retreat, Brahmani is the perfect choice. A vibrant community of yogis of all ages and levels, there is something here for everyone. Brahmani has a reputation for offering an excellent array of Yoga Alliance Registered teacher trainings, including programs in Ashtanga, Vinyasa and Prenatal Yoga. The setting for Brahmani is high upon the hill of Tito’s White House, and its shalas have stunning views of the surrounding villages, including Anjuna, Assagoa and Vagator. If you’re travelling alone and want to plug into a spirited community, definitely visit Brahmani Yoga. 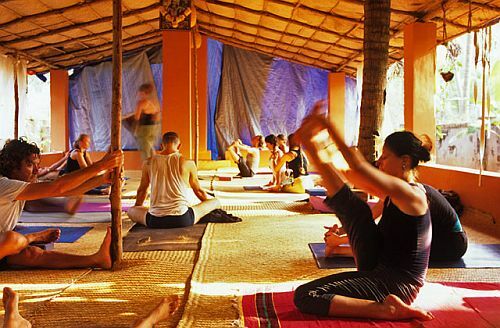 Chattai Yoga is located in the soft surroundings of South Goa’s Agonda Beach, where they have two venues. One sits high upon the cliff just above Agonda Beach. The other is located directly on the beach. Although both vantage points are stunning, the cliff is magical, giving a feeling of seclusion. You can easily walk from the cliff down to the beach, as long as it’s low tide. Once the tide is high, you’ll have to pay 100 rupees to cross the waterway in a tiny boat rowed by one of the local men. Chattai, which offers charming beach hut accommodation, each with their own verandas, holds yoga retreats, and also opens its venue to house guests when there isn’t a retreat. Chattai has a very limited, mediocre restaurant, but not to worry because the beach below has some of the best restaurants in Goa. Chattai’s simple thatched-roof shala is exquisite and sits upon the cliff’s edge overlooking the Arabian Sea. Lotus Yoga is an impeccably designed, as well meticulously maintained, beach hut-style guesthouse on the very party-oriented Patnem Beach in South Goa. Located at the end of the beach, Lotus is nestled up against the ‘holy mountain,’ so it is a peaceful sanctuary amidst the busyness. Lotus’ open-air shala is as close to the sea as permitting allows, making it an extraordinary place to practice yoga. Lotus offers both retreats and drop-in yoga classes. Purple Valley, known for its excellence in Ashtanga instruction, is one of the most famous centres in North Goa. Open from late October through late April, Purple valley hosts many of Ashtanga’s most renowned teachers, including Dena Kingsberg, Kino MacGregor and Michael Gannon. In the village of Assagoa, the setting is lovely and peaceful. Purple Valley is quite self-contained, so it is the type of place that once you arrive, you may never want to leave. It is a full-service retreat with a spa and delicious, health-conscious cafe. Satsanga Retreat is a family-run retreat centre, set in the small village of Verla Canca, just south of Anjuna. Gracing numerous “Best Yoga Retreat Centre” top 10 lists, Satsanga is considered a home-away-from home by its guests. Open from mid-September until mid-May, Satsanga welcomes houseguests and hosts teachers from around the world holding retreats, including Glenn Ceresoli, Heather Elton, Julie Martin and Emil Wendell. Here, you’ll be immersed in lush, tropical gardens, surrounded by artistic details, sculptures and colour at every turn, as well as cared for by a warm-hearted and attentive staff. Satsanga is also known for having the best food in Goa because of Mani Shivadas, their Ayurvedic chef. Sushumna is just a 5-minute walk from North Goa’s most beautiful beach, Ashwem. A lovely setting for a yoga retreat, Sushumna has manicured gardens and paths, quaint accommodation and a decadent health-food café and juice bar. Sushumna’s full schedule of daily drop-in yoga classes are open to everyone, and they also hold several retreats and teacher trainings. Yoga Bones is owned by the most well-known and beloved Ashtanga yogis in Goa, the husband and wife team, Rolf and Marci Naujokat, who teach yoga year-round in Anjuna. Rolf started teaching in Goa in the 70’s, when he offered yoga to friends for free on the beach. Students from every country in the world, literally, come to practice with the Ashtangi pair to receive expert instruction, offered with the utmost love and respect. Students often stay for many months studying with Rolf and Marci, who treat them like family, which creates a community within a community. When Rolf and Marci’s shala fills to full capacity at the height of the season, which is late December to early March, so do the guesthouses, home stays and hotels in Anjuna. Reserving your space in advance for practice and accommodation is essential. Yoga Magic a gorgeous eco-village in Anjuna. 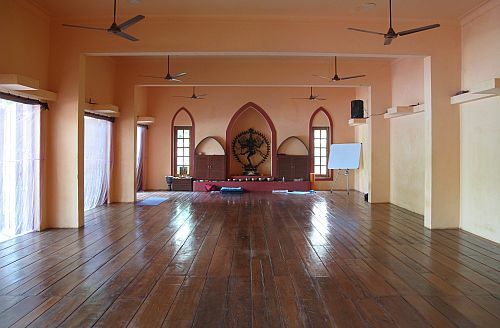 An absolute sanctuary, Yoga Magic is one of the most intentionally built and run yoga retreat centres in Goa. You’ll have the pleasure of staying in a luxurious and spacious Rajasthani tent. Delightfully appointed with the finest furnishings, beddings and art, the accommodation at Yoga Magic is like no other. Walking from your tent along the winding, bougainvillea covered paths, you will see glimpses of the rice paddies, which surround Yoga Magic, making it one of the most peaceful places in North Goa. Dining at Yoga Magic is pure pleasure, with their gourmet, lovingly prepared local fare. Namrata Narula teaches yoga here, and she is a treasure. The shala, a very special space, features a cow-dung floor and thatched roof. Although a way of life for many, Goa has definitely become a destination for practitioners of yoga. 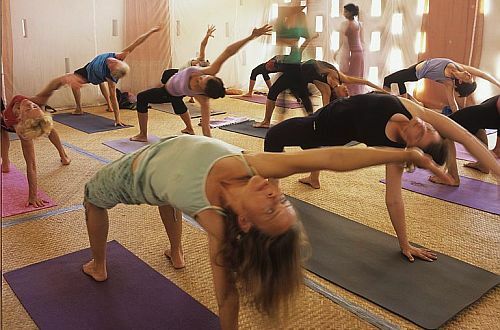 This is just a short list of venues which offer dedicated spaces for practicing yoga in Goa. If you love yoga and have been drawn to visiting Goa, you may be overwhelmed with your choices of retreat centres, drop-in centres and teachers to practice with. However, one thing is certain, you will be in yoga heaven. Thanks for sharing . I agree with you that yoga for the physical benefits, but i realized immediately that the practice transcended the physical. Affecting her deeply emotionally and spiritually. I also had joined yoga classes in goa and it is a prefect place to learn yoga.